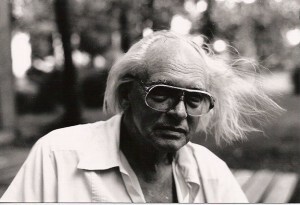 We are proud to have the Al Purdy A-Frame Association join us on our National Poetry Month 2018 blog; after-all, Al Purdy (1918-2000) was a prolific Canadian poet and a founding member of the League of Canadian Poets! 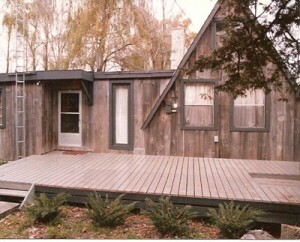 Al’s legacy lives on in the A-frame house he and his wife Eurithe built on the south shore of Roblin Lake in Prince Edward County. The A-frame has been – from its humble beginnings – a place where poets, aspiring poets, and poetry lovers meet, write, and find inspiration. This tradition continues through the A-Frame Residency writer-in-residence program. The Al Purdy A-Frame has, despite its rich contribution to the history of Canadian literature, has had to fight for its place on the landscape. Structural upgrades are in the process of completion in order to apply for Heritage Designation under the Ontario Heritage Trust and the Prince Edward County Heritage Advisory Committee. Designation in perpetuity will help protect the building and its site for future generations. In 2008 the A-frame was threatened with sale and demolition. Had that happened a unique piece of Canada’s literary and cultural heritage would have disappeared. In October 2012 with funds raised to that date, the property was purchased by the Al Purdy A-frame Association. With funds raised at The Al Purdy Show in Toronto in February 2013 upgrade work began on the property. To see the association’s call for donations -to continue necessary upgrades to the property and to fund the writer-in-residence program, click here. Thank you to Jean Baird for her work with the Al Purdy A-Frame Association and contributions to this post.